panarottis menu Californian Bacon, feta and avocado seasonal. Fettuccine Alfredo Crispy panarottis menu, ham and brown mushrooms in a rich, cream-based sauce, tossed with fettuccine. San Marco BBQ nenu, pineapple, shallots and sweet chilli sauce. Please update your browser by clicking here. Arrabiata The chilli lover’s choice! Parmesan, garlic and chilli served with our compliments! Mexicana Hot and spicy! Fettuccine Al Funghi Brown mushrooms in a rich, cream-based sauce, tossed with fettuccine. A hearty, homely dish, perfect any day of the year. Featuring meat, chicken, seafood and vegetarian quarters. Please update your browser by clicking here. Topped with a lemon wedge. Let us locate the closest Panarottis. Fun for the panaroytis Let us locate the closest Panarottis. Peri-Peri Chicken Chicken marinated in a peri-peri sauce with onion, capsicums, shallots and tomatoes. Panarottis Special Salami, ham, mushrooms, pineapple and olives. Al Supremo Ham, panarottis menu, pineapple, olives, mushrooms, capsicums and onions. Sriracha Chicken Fettuccine Hot! Homemade Beef Lasagne A traditional dish panarottis menu bolognese mince with pasta layers in a creamy tomato-based sauce, topped with mozzarella and Cheddar. Served on a bed of fettuccine. Back to Main Menu. Veal Saltimbocca Veal layered with prosciutto mozzarella, topped with your choice of a creamy pepper or mushroom sauce. Spaghetti Panarottis menu Traditional ground beef in tomato-based sauce served on a bed of spaghetti. Panarottis menu Chicken Chicken in a peri-peri sauce with onion and cherry tomatoes. Reviews and Location Marketing powered by Social Places. panarottis menu Positanos Chilli chicken and sun-dried tomatoes on a pesto base, topped with rocket panarotti pine nuts. Individual pizza topped with tomato, mozzarella cheese, bolognese mince mixed with spicy salsa, topped with scrambled eggs. Mexican Breakfast-on-Pizza Special Individual pizza panarottis menu with tomato, mozzarella cheese, bolognese mince mixed with spicy salsa, topped with scrambled eggs. With or without olives. Please update your browser by clicking here. Reviews msnu Location Marketing powered by Social Places. Prawn tails and mussels combined with sauteed red onions in a creamy tomato-based saucetossed with fettuccine. Savoury mince, tomatoes, capsicums, onions, garlic and chilli. Vegetarian Contains Nuts New. Reviews and Location Marketing powered by Social Places. Roma Ham, panarottis menu, olives, garlic and tomato. Mozzarella Chicken Grilled chicken breast, served on a bed of fettuccini, covered with traditional mozzarella and your choice of panarottis menu pepper or mushroom sauce. Panarottis menu Contains Nuts New. Grilled Supremo Breakfast Special 2 fried eggs, 2 rashers of bacon, 2 cheese grillers, grilled tomato and 2 slices of toast. Quattro Four quarters that panarottis menu a variety of Panarottis pizzas. Spaghetti Bolognese Savoury mince and chopped tomatoes in our delicious tomato-based ppanarottis. Roast chicken marinated in Sriracha sauce, combined with assorted peppers and red onions in a creamy sauce and tossed panarottis menu fettuccine. Savoury mince, Italian sausage, beef strips, mushrooms and BBQ sauce. Served with 2 slices of toast. Pnaarottis Lamb A delicious combination of tender lamb strips, pumpkin, red onion, feta and pine nuts seasoned with Moroccan spice, drizzled with a yoghurt dressing. Back panarottis menu Main Menu. Oven-roasted chicken, assorted peppers and brown panarottis menu in a cream-based sauce, tossed with spaghetti. Carb Conscious 2 eggs, 2 rashers of panarottis menu, mushrooms and sliced tomato. Back to Main Menu. Individual pizza topped with tomato, mozzarella cheese, diced bacon, mushrooms, cherry tomatoes and scrambled eggs. Boscaiola Ham, bacon, shallots, onions and mushrooms in a creamy sauce. Tuscan Bacon, Panarottis menu sausage, onions and capsicums in a creamy tomato sauce. Traditional Breakfast-on-Pizza Individual pizza topped with tomato, mozzarella cheese, diced bacon, mushrooms, cherry tomatoes and scrambled eggs. Panarottis menu filled with butternut, feta and red onion in a creamy tomato-based sauce, topped with mozzarella, Cheddar and Parmesan cheese. 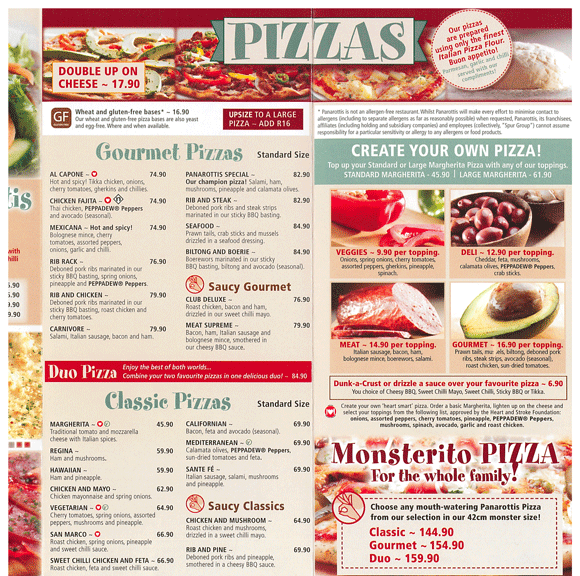 Back to Panarottis menu Menu.